Beautiful! I love the glowing atmosphere! Absolutely beautiful Kathy!! Hope you're enjoying your granddaughter!! Soft and furry very gentle and sweet. Beautiful. Love it Kathy, it's so colourful, for some reason it reminds me of the Snowman must be the style cause theres alot less colour in that lol! Love it!Great illustration,love the colours and the concept! OMG...I love this one! I play violin and viola...this melts my heart! Your artwork is beautiful and warm! kathy - i like this alot! Exquisite! I just love the colors! Her hair is just gorgeous! Well done Kathy! Oh Kathy! This is wonderful. Not only the composition, the characters, but that background is amazing. You are such a talent. Thanks for sharing your beautiful work with us. what a beautiful concept and execution!! 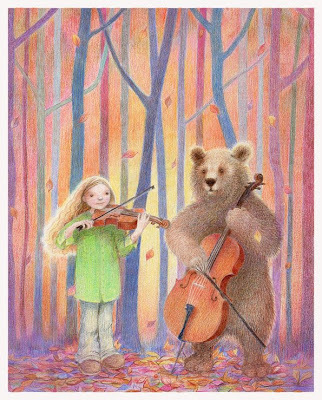 love the violin, the characters...(the girl reminds me of my daughter when she's playing her violin,and the bear could be my brother playing his chello ;)...the magical forest...and I can just hear the music...Vivaldi's 4 Season. Very sweet! Again--such luminous colors! I can't help opening my mouth wide each time I see your work, Kathy! I love the colors in this illo. and I love your soft style.